How can you fabricate a huge number of complex nanostructures in a split second? One important strategy used by materials scientists exploits a phenomenon called self-assembly. 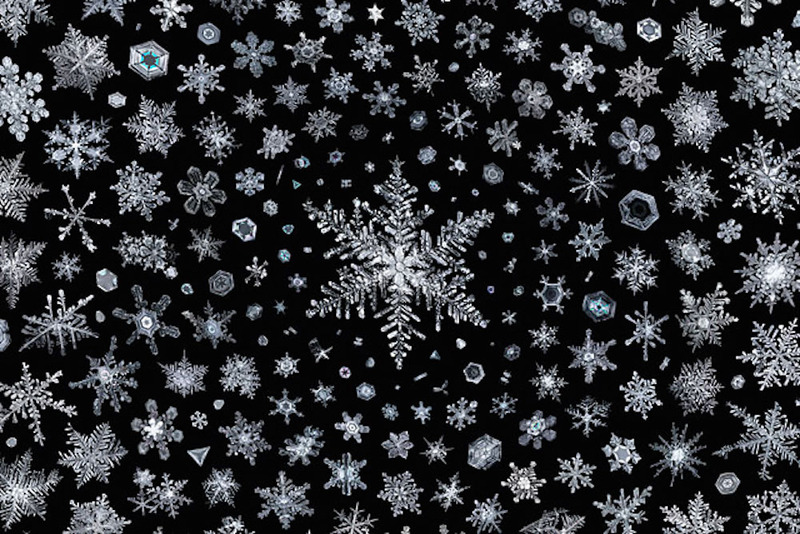 Self-assembly is a familiar concept to us: snowflakes self-assemble from water molecules if the temperature is just right, and many small molecules can self-assemble into larger ones, even into forms of life, under the right conditions. Self-assembly is fast, which gives it clear advantages as a technique for the mass production of materials and complex structures. But before self-assembly is ready for prime time, scientists need to establish the playbook—a set of tactics, conditions, and parameters to control self-assembly, so that desired nanostructures emerge from the unstructured soup of basic building blocks that are fast-moving atoms and molecules. One such technique is the use of template surfaces. These templates control the behavior of atoms and molecules in the same way a waffle controls the distribution of maple syrup across its surface. The surface of the waffle is structured, with a regular array of impressions that create traps for the syrup. Without these impressions, the syrup would run off and over the edges, as it does with pancakes. This technique works just as well to control the locations of atoms and molecules on surfaces. On an unstructured surface, atoms cluster randomly. When the template surface is structured with nanometer accuracy, however, atoms and molecules diffusing across the surface are trapped in particular sites. Learning how to control the arrangement of nanoclusters on surfaces might be key to fabricating ultrahigh density data storage devices, and to developing other materials with new and unexpected properties. Check out the video below to see how researchers at Cal Tech have produced identical snowflakes by controlling the conditions of their self-assembly! Fig. 1 (Click to enlarge) A waffle helps maple syrup stay! Syrup on the surface of a pancake runs off and over the edges. A waffle provides pre-determined traps for the syrup, thus arranging it into pockets of flavor! Fig. 2 (Click to enlarge) The structured surface of a tungsten single crystal (inset) limits the diffusion of cobalt atoms, which are trapped to form small clusters. The arrangement of these cobalt clusters is highly ordered, resembling the structure of the template, or "nanowaffle." 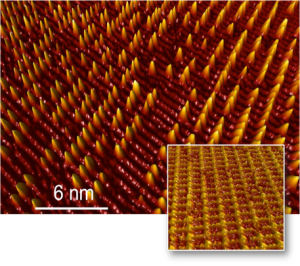 Despite the smallness of this corrugation, it is easily visible to a high-resolution scanning tunneling microscope, with which these images were taken.